With rising food costs, it seems like everyone is looking for ways to lower their grocery bill. I’m a pretty frugal girl by nature so I try to do everything I can to keep costs down and stretch what I have as much as I can. Here I’ve complied a list of tips and tricks that I’ve learned along the way to help you lower your grocery bill and stay within your budget. Making a menu plan based on what you already have and what’s on sale is a great way to keep grocery costs down. It seems like everyone has a different system for Menu Planning. Follow my 6 steps for menu planning success here. Menu planning is great, but if your consistently planning meals based on expensive ingredients, then you aren’t saving as much as you could be. Before you sit down to do your menu plan, check the sales flyers for your local stores and base your meals around what’s on sale (save even more if you have a coupon to go with the sale). Also, if you see something for a great price don’t be afraid to stock up! Bonus Tip: Don’t forget about the drugstores! They are a great way to get groceries at rock bottom prices. Click here to learn more about how to save at CVS. A price book is a record of what you pay for certain items on a regular basis. It’s also a place where you record rock bottom prices (i.e the lowest sale price or stock up price.) Sometimes you think you find a great deal at one store, but then see it at another store for cheaper. Keeping a record of prices at each store will help you to avoid this situation. Growing your own food is a great way to save money on produce, especially if you start your plants from seed. We have a large garden and I normally don’t have to buy produce in the summer months. Check out my post 5 Tips for Beginner Gardeners if your thinking about starting a garden and want to learn more! If you grow your own food, then you will more than likely have a surplus and getting together with fellow gardeners to swap produce is a great way to get more for you money! Also, if you stock up when things are on sale and buy a few extra you could always get a couple of friends together and trade for what they have on hand. We have so many choices in food these days that its easy to get caught up in eating whatever we feel like without thinking about what it will cost, but our ancestors did things differently. They ate simple food on a regular basis such as rice, beans, potatoes, bread, etc. and saved the more exotic ingredients for special occasions. We could save a lot of money and be a lot healthier if we ate simple meals on a regular basis. Check out my post 30 Frugal Meal Ideas (for when you’re broke) for inspiration in simple cooking. Dairy is another expensive category that is worth cutting down. Consider using less cheese in recipes or buying blocks to shred yourself. Also, keep an eye out for coupons and rebates on these items and stock up when they are on sale if you have a way to freeze or use them up before going bad. Did you know that people who pay with cash tend to spend less that those who use a card? Take your budgeted amount in cash to the store and leave your cards at home. This way if you come up short you will be forced to put something back to stay within your budget. To save the most money, you will need to be flexible and creative when cooking. If you have everything but one ingredient to make a dish consider skipping it or replacing it with something else. This way you will are saving money and reducing waste. Also if a recipe calls for an expensive ingredient consider switching it out for a cheaper alternative such as beans for ground beef. Plan your meals, go shopping and then stay out of the store until the next week! Anytime you run in just to get milk or cheese then you are more than likely going to buy other things that you didn’t even know you needed or wanted. If you run out of something then consider substituting or going without it until your next planned shopping trip. The less you go to the store, the less you will spend. Find your stores discounted sections and look through them every time you go shopping. You never know what you will find and if you see a good deal then stock up! Normally stores will have several different areas with marked down items so keep your eyes peeled. You will want to consider expiration dates before buying. My absolute favorite grocery store is Aldi because they have high quality items at discounted prices. I can easily save 30% or more just by shopping there instead of Wal-Mart. See if you have an Aldi or other discount grocery store in your area and frequent them regularly. Also, see if you have a bakery outlet where you can find breads, rolls, etc. at discounted prices. These items freeze well so you can stock up if you find a good deal. Dollar Tree is another store worth checking out especially since they accept coupons. They regularly carry name brands such as Nature’s Own Bread and Hormel Pepperoni. Plus, they accept coupons which makes for some great deals! 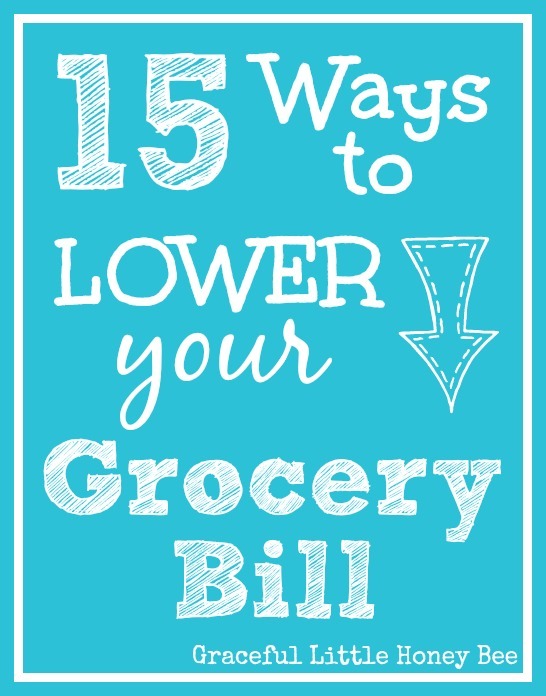 I hope this list will help you to reduce your grocery bill and keep more money in your pocket! Do you have any other tips to add? I’d love to hear them! I have been also having a couple meatless days a week to save money. I try to eat peanut butter, beans or dairy for additional protein on those days. Butter prices are going crazy. The best price I found was Farmbest (or farm something) at Wal-Mart grocery. It was $2.98 a pound. I had already bought 3 pounds at Braums for $3.09 since it's been running $3.59-$5.50 a pound elsewhere. I froze 2 pounds of it. However, Aldi's had it on sale today for $2.29 a pound. So I bought 2 more pounds, 1 in the fridge and 1 in the freezer. I have also read about saving money on milk by buying a gallon of Vitamin D and mixing it with water in a clean empty gallon (I normally drink 2%). The blog writer mixed it half and half. I mix one of the gallons 1/2 and 1/2. The other for drinking I mix the half milk with 1/4 water. The half and half is for cereal. The other is for drinking. It took a bit over a week to get used to the taste but it sure saves money. Since it's cold been doing laundry in the daytime to get the ambient heat in the house. I also have been using the oven (electric) more. When done I throw the door open to help warm the house. I even have cut back to not be wasteful on toilet paper, using only what is needed. On conditioner I have been adding hot water to the last of the conditioner to get the rest out of the bottle. Then I thought, well I could add some of the new conditioner to the old bottle and add some water to it and save money that way. I am also on a gas budget. Planning trips to include all stops needed in that direction even for things close by. After church I have only been going to places I have a really good discount for. That's about the only time I have been eating out lately. There are some secret shops I could do, but they only reimburse the price of the meal for two. Unfortunately there's so much time taking notes and filling out the forms, I am not sure it's worth doing. I am also trying to be careful to use only a pearl size amount of toothpaste when I brush my teeth. I also discovered that buying a scoopable litter ends up being less work and lasts longer than the cheaper kind. I scoop every other day but only have to wash the box out about once a month. The regular clay I had to scrub it once a week. The cost is roughly the same as you have to buy less scoopable. I also keep the heat at 68-69 degrees and bundle up. Don't let the water run unnecessarily and be good about turning off lights when I leave the room. Even on an average billing plan, I lowered my bill $4 per month. I called my insurance company and increased my deductible and decreased my coverages for a while as I am currently without employment. My auto, renters and valuable personal property (Are you aware jewelry and other valuable items aren't always covered by your renters or homeowners policy? I found that out when a coworker lost her valuable items and jewelry and her insurance gave her a terrible run-around.) went down from $105 to $64 a month. For money I owe my folks, I bartered housekeeping with them at the hourly amount they have paid a housekeeper in the recent past. That money comes off the amount I owe. That's some of what I have been doing lately to save money. Wow it sounds like you really know how to cut corners! I just bought 4 lbs of butter from Aldi and put it in the freezer. I'm hoping that they will drop the price down even further. I remember last holiday season it was down to $1.69 at one point! I am joining from the Frugal Friday Link Up Party. I have always been inspired to try to cook freezer meals. I should just do it. Thanks for sharing these awesome tips. All good tips. I believe in cooking from scratch definitely. We do have an Aldi (a few of them) and I am sold as well. I can even get some of my fancy grocery store niceties there too! Great lessons to learn. Yes, we slowly took out meat and dairy from our diet. Its cheaper and also a healthier, more simple way to live. The one about the price book is what we struggle with. I keep kind of a mental price book (and my memory's pretty good) but isn't definitely not completely accurate, so I need to work on that one. Great post! Stopping by from Thrifty thursday! Its amazing how just cutting down on meat will save you big bucks! Love all of these tips. I need to start menu planning for my family. This will save me so much many!